An easement is a right attached to land, which gives another party (such as us) the right to use the land for a specific purpose even though they are not the land owner. We acquire easements over land to ensure that we can protect, access, operate and maintain our water and sewerage infrastructure that is located in private land. During construction of a development, it is the applicant's responsibility to prepare an easement in favour of Queensland Urban Utilities, so that we have unrestricted access. Easements are legally enforceable by South-East Queensland Water (Distribution and Retail Restructuring) Act 2009, Land Act and the Land Title Act. *Easements may be required by councils and/or the State for sewers passing through council or State owned land due to requirements under the Land Act 1994 (if the land is State Land) or Council land use policy. It is the developers responsibility to contact the respective Council/Authority through whose land they intend to cross to seek permission to enter and to ascertain if an easement is required. Where a maintenance structure (maintenance hole, maintenance shaft or terminal entry point) is located on private property, a one metre wide easement, for sewerage purposes, running along the side boundary from the street frontage and containing the maintenance structure is required to facilitate access to the structure. This requirement applies to all maintenance structures, including those that are located on sewers of 300mm diameter and smaller. This requirement is generally in accordance with the SEQ Code but it ensures that the easement extends to the maintenance structure when that structure is on a sewer that doesn’t require an easement. 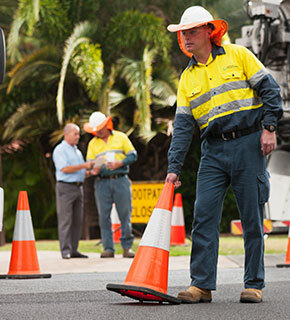 These amended easement requirements only apply to sewers within Queensland Urban Utilities’ service territory and do not affect requirements of the other SEQ service providers. Current title search of the property - If the easement is to be granted on Common Property, a copy of the Community Management Statement must also be provided. A copy of the proposed easement on a survey plan (Form 21 (PDF)) signed by the surveyor. The easement design must be in accordance with Queensland Urban Utilities' guidelines and standards, including the SEQ Code. As-constructed drawings certified by an RPEQ Engineer or design plans for water or sewer infrastructure (in PDF format). Architectural drawings or design plans, as per approved Development Assessment plans. All required information above must be received for the application to be deemed ‘properly made’. The surveyor is responsible for ensuring the correct easement information is provided. A ‘properly made’ easement preparation application will be processed within ten business days unless technical and or legal negotiation is required. We will review the proposed easement arrangements to confirm it meets our requirements, before finalising the easement documents (Form 9 (PDF)) for legal execution. Once you have received a Form 9 signed by Queensland Urban Utilities, your solicitor can stamp it for stamp duty purposes. The Form 9 can then be lodged with the Titles Registry Office.